1. Is there a story you’ve written that will never see the light of day? Why would you deprive us of this genius? I wrote a story about four years ago now called “The Blessed Hands of the Sainted Fool.” It was light steampunk with a romantic element. I sent it out to ten markets. No one wanted it. That made me wistful and sad. When I was pondering a new novel to write, I thought of a scene from that story: an airship flying over this blessed, illuminated stone road. 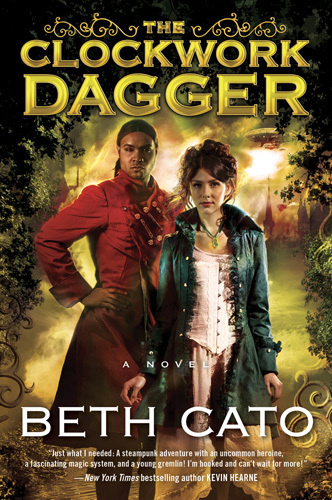 That ended up being the initial spark for THE CLOCKWORK DAGGER, my novel from Harper Voyager, and the story characters even play small yet important roles. 2. What’s a story you’ve never written, but always wanted to? I love historical fiction. I have done several stories set during the Civil War and Old West, and I would like to explore more facets of that period and add speculative elements. There’s so much potential there that it’s overwhelming. 3. Is there a character or plot point you’ve wanted to change in retrospect? That’s a big worry with my novels in particular. I think that’s one reason I’m glad for plotting THE CLOCKWORK DAGGER as a duology. Everything fits together pretty tightly. I didn’t have to worry about a middle book. 4. Which of your characters would you never want to meet (in a dark alley or otherwise)? There’s a character in THE CLOCKWORK DAGGER named Mr. Drury. He’s a traveling tea salesmen and a total slimeball. Touchy-feely in a dominating, patronizing way. I’ve known guys like that and I put up with nonsense I shouldn’t have. I hope that the next time I confront that sort, I’m not afraid to fight back. 5. Which of your worlds/realities/cities would you never want to visit? My books have a capital city named Mercia that’s like a steampunk Coruscant, with a skyline of towers and factories belching putrid smoke. The place is rife with poverty, refugees, and disease, and a male population maimed after fifty years of near-constant warfare. Buildings and people rot. It’s not a very nice place. I recently wrote a story set in my hometown of Hanford, California, in 1880. I would love to see how that part of California looked a century before I was born. If I had a time machine, that’s where I would go, and then go further back to see how it was before any agricultural settlements existed. 7. Is there a piece of writing advice you’ve never followed? “Don’t listen to what other people say.” It’s a black and white statement that sets up a writer for failure. You have to pick and choose what advice and criticism to accept. If you avoid comments entirely, it’s foolhardy and arrogant. 8. What is an aspect of the writing craft you’ve never had a problem with (and why)? Descriptions. I have a natural knack for them and can go on and on and on. I’m very attuned to sensory things around me in reality, so I can evoke that in my writing… and I’m often asked to tone things down a bit. My agent made a note to me once that I needed to “cut out the gremlin pee.” I thought I was making things more realistic! 9. What’s the one book out there you wish you’d written (but of course won’t, because it’s already written, and writing it again would be plagiarism, and that’s just mean)? *laughs* Probably THE SPARROW by Mary Doria Russell. It’s one of the best books I have ever read. It’s intelligent and emotionally devastating. I want to be at that level someday, but I don’t know if it will ever happen. 10. What aspect of writing will you never stop working to improve in? Oh, there’s plenty of room to improve in many aspects. A lot of times it seems I get the main plot okay in the first draft, but necessary subplots are still wishy-washy for a few more drafts. That’s where I really rely on critiques to find those weaknesses. 11. What’s one part of the publishing industry/process you wish you could do without? THE WAITING. Good grief. Editors, whether they work for a small press or the Big Five, are always buried in manuscripts. The wheels grind slowly. It’s torture for any writer to wait for word on a short story, and it’s even worse when it’s a novel. 12. What’s the one thing you would never do to shamelessly promote your current/upcoming release? Show skin! One of the wonderful things about steampunk is that it’s not difficult to dress up for conventions in something that’s modest but still very flattering. 13. What’s a question you’ve always wanted to answer, but have never been asked? Do you wish you could give writing advice to your younger self? Yes. As a kid I wanted to be a novelist. That dream withered and died when I was a teenager. I had no confidence, no ability to take rejection, and a lot of family pressure to not write fantasy (my soul was in peril, etc.). I stopped writing what I wanted to write for almost ten years. I wish I could tell my younger self to keep writing, and most of all, keeping reading fantasy. But this is a catch 22. I needed that time to grow up, too. To suffer and live and endure my first jobs and my husband’s deployments. Those hard times brought a lot of fuel to my writing. 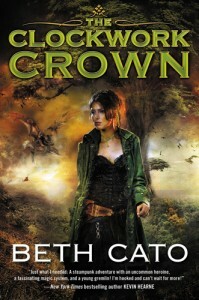 Beth Cato is the author of THE CLOCKWORK DAGGER steampunk fantasy series from Harper Voyager. 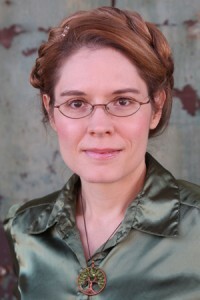 Her website is BethCato.com.